This is an often perpetuated myth by registries and those in the humane care community that do not support the Pit Bull breed and others that do not understand the Pit Bull's well established history as a pure breed or what it takes to meet the standard of a pure breed line. By the 1700's there were two primary bull baiting dogs that had developed. This was the Blue Poll of Scotland and the Alunt from Ireland, both of which were referred to as bulldogs. As this and other dog working and sporting activities were developed people selectively bred different dogs to achieve the working attributes that they most desired. They often mixed these breeds with the great dogs of England, which by this time were also used to bait bulls. By the time of the early 1800's due to selective breeding a dog had emerged, which was very similar to the American Pit Bull of today. 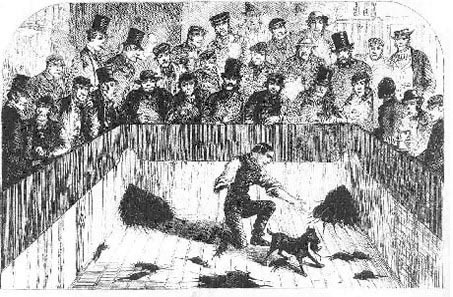 Due to a slow economy and laws, which prohibited people of low economic means from owning a sporting dog the practice of bull baiting began to diminish. THIS IS IN FACT WHERE THE "PIT" IN THE AMERICAN PIT BULL TERRIER NAME CAME FROM - NOT FROM FIGHTING OTHER DOGS. An interesting and little known fact is that Teddy Roosevelt worked ratting dogs in the basement of the White House. As with today the ownership of the Pit Bull crosses all ranges of human diversity and is often seen as a point of unification by those who are enthusiasts of the Pit Bull breed. 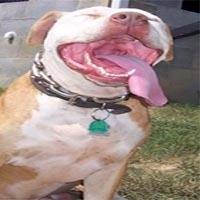 Most Pit Bull owners feel although in some cases we may have to keep our love for the breed hidden from society in general due to the discrimination often faced by those ignorant of the breed in today's society. In a sense however as enthusiasts we all belong to a Family with the Pit Bull being the common bond. Many today are under the misunderstanding that Pit Bulls were bred historically for fighting against each other. This is a myth that has been perpetuated by some registries over time that have supported such activities. As it was with these registries so today do some individuals still cling to this myth out of selfish motives of personal gain and self righteousness. While some individual Pits have been bred for this purpose it is important to note that this is but an infinitesimal part of the breed's background and has never been practiced by more than a small percentage of its owners. Even the most prolific dog man in history John Colby stated that fewer than 10% could ever meet the criteria necessary for such a ask. If a species is in fact judged based on the small minority then we as humans have historically been bred as murderers, rapists and child molesters. For those that believe in the theory that the minority defines the whole then so too should they also proudly wear this label themselves. If one does not wish to wear such a label themself then they should not be so selfish as to apply it to the Pit Bull breed. As colonization of America and Canada began growing immigrants and explorers also brought their dogs. These dogs soon became known by the current name of "Pit Bull Terriers". Due to the protective nature many Pit Bull owners had at the time many refused to register even though the breed standard had become officialized. During this period Mr. Bennett found dealing with many Pit Bull owners to be difficult and even in some cases hostile as they felt dogs should be kept close to one's family and friends and this was an attempt to make them more widely available to the general public. To this very day there still remains some level of hostility by some against certain registries as they wish to either have greater control of the market themselves or still hold onto an historical concept of fighting out of selfish personal motives. Today many Pit Bull owners still continue to not register their dogs due to privacy concerns - especially with ramped Breed Specific Legislation ( BSL ) - financial constraints and subsequent loss of lineage determination. While the Pit Bull is the most popular breed in America fear, finances and discriminatory registry processes by some registries still result in only about 50% ever being registered. Today the Pit Bull breed is in fact the most unregistered purebred line of dog in existence. This has fractured supportive services to Pit Bull owners and over the years has worked to severely diminish the value of the Pit Bull breed as a whole. The history of the Pit Bull is quickly disappearing and being re-written by those with personal motivations, self interest and discriminatory bias. One of our goals at the APBR is to capture the true history before it is gone forever. As noted the Pit Bull was known as a working breed throughout its development. During the Civil War Sallie became the 11th Pennsylvania Volunteer Infantry mascot where she was in battle including Gettysburg where she was lost in the fog of battle and returned to the Union line where she stood guard over the dead and wounded. Later in 1865 at the battle of Hatchers Run she was perished. Today a monument id Sallie now stands at Gettysburg in devotion of her service. Also during the Civil War the 102nd Pennsylvania Infantry chose Jack as its mascot where he took place in nearly every regiment battle in Virginia and Maryland and was included in such battles as Antietam, Spotsylvania and the siege of Petersburg. Jack may have very well been one of the first recognized search and rescue and cadaver dogs as his purpose was to seek out dead and wounded after battle. During his service Jack was captured twice and is the only dog to ever have been recorded and being traded as a prisoner of war. Other notable war dogs include Old Harvey mascot of the 104th Ohio Infantry, whose tag read "I am Lieutenant D.N. Sterns Dog. Who's Dog Are You? And Jack Brutus of the Spanish American war the official mascot of Company K First Connecticut Volunteer Infantry. 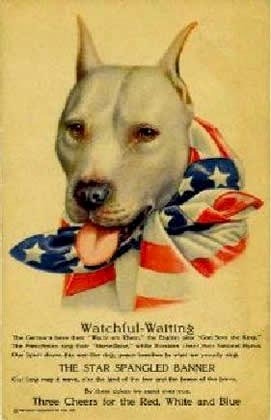 By the time of WWI the American Pit Bull Terrier had became a well-loved and desired dog breed of choice. 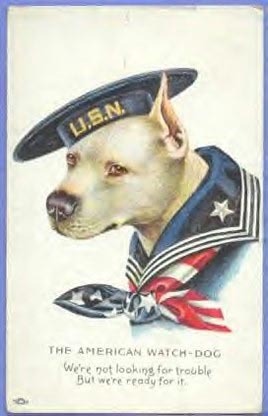 In fact the Pit Bull was used as America's canine military mascot of the time as seen in such posters as these during wartime. 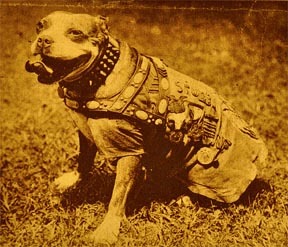 In 1917 a Pit Bull by the name of Sgt. 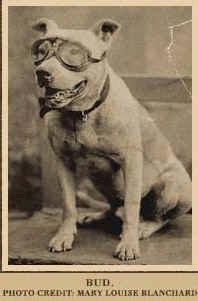 Stubby became a war hero for saving several soldiers lives and even capturing a German Spy while in the trenches of France with the 26th Yankee Division. A bust of Sgt. Stuby was even donated to the Smithsonian for historical purposes where it is proudly displayed today. Sgt. Stubby is the most decorated war dog in history to include having earned the Purple Heart for injuries sustained during combat. Sgt. Stubby was a quick learner and doe to his canine hearing was able to often warn of incoming artillery before humans could hear their approach thus giving them a chance to duck for cover. After being gassed he began using his keen sense of smell then to also warn of gas attacks. After his war career his owner went to Georgetown University Law School where he Stubby then became the schools football mascot and entertained the crowd. His performances are actually deemed the inspiration of the start of "half time shows". The greatest shame is that the American Military establishment has now turned its back on the breed and in many cases even makes it impossible to own for those who live at many military bases. These policies should be revisited and the Pit Bull brought back into service. It has been proven that dogs can clear a building six times faster than their human counterparts. We should ask ourselves why are we risking human blood when a dog can do the job better and faster. Because of the nature of dog movement and fear many have of them war dogs are also less likely to be wounded as the enemy often chooses to hedge its bets and flee instead. 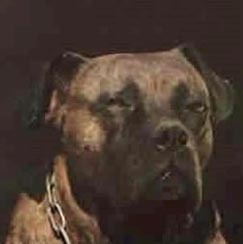 Later the Pit Bull breed was used to signify sturdiness, dependability, and loyalty by such organizations as Nipper of RCA records, Buster Brown shoes, Tige (thought to be the first talking dog in comics) and even the loveable Petey of the Little Rascals. In fact the first dog to travel across America in a car was a Pit Bull ( Bud ) who traveled along with the first persons ( Horatio Jackson and his assistant and "bicycle" mechanic Sewall Crocker ) to cross America in a car ( a Winton named the Vermont). During the trip Bud would assist in watching for large bumps in the road and often received as much if not more attention by the press than did Jackson. 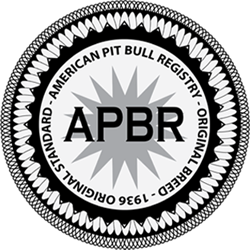 At the APBR we recognize the working nature of the Pit Bull breed and work to bring a higher purpose back to its ownership through the use of service dogs in all capacities from disability Service Dogs to search and rescue, to detection, anti-terrorism and therapy work. If you own a Pit Bull realize you own the greatest breed in history and should treat it with the level of respect and honor it deserves.